Building on its already established flagship controller and digital mixer, Denon DJ has announced the new generation, MC6000MK2. Changed, improved and now supplied with Serato DJ software, the MC6000MK2 combines impeccable, steel chassis build quality and rock solid reliability with total, uncompromising Serato compatibility (other software is also supported with mapping). Crafted for professional and discerning club, mobile and house-party DJs, the MC6000MK2's control surface is structured to enable plug and play communication, directly with the bundled Serato Intro software. DJs wishing to add alternative software functionality and video mixing features can then add the Serato DJ and Serato Video plug-ins if desired. The new MC6000MK2 continues the legacy of, and improves upon, its predecessor with 4-deck, real-time channel matrix operation, full 'kill' EQs and EFX control. Optimal 24 bit audio quality with comprehensive connectivity is also provided, plus the ability to act as a fully independent, standalone digital DJ mixer. Denon DJ have listened to user feedback and rebuilt the MC6000MK2's facia control operation to enable literally error free performance functionality in 'real world', live DJ situations. Under the hood improvements include a significantly enhanced digital audio signal to compliment the most demanding of club, bar and party sound systems plus 'mixtape' recording and radio presentation too. Fully professional video mixing integration is now possible with the MC6000MK2's video capability. Using the revolutionary Serato Video plug-in, DJs can programme, mix, add transition FX and scratch video just as they do with audio. So, now, "What you hear, is also what you see!" The MC6000MK2’s reliable, real-time channel matrix operation enables fast and efficient DJ changeovers, plus the flexibility to add record decks, table top CD players, USB audio and other auxiliary input devices. Replacing the previous model's two toggle switches, the MC6000MK2 now features Four independent deck layer keys - offering error free, live performance deck/track selection. The controller also now offers the ability to utilise 'on-trend' DJ performance effects such as 'Roll' (loop whilst track continues in real time), 'Sensor' (Serato's Backwards mode) plus 'Slip' (real time track playback under a scratch session). 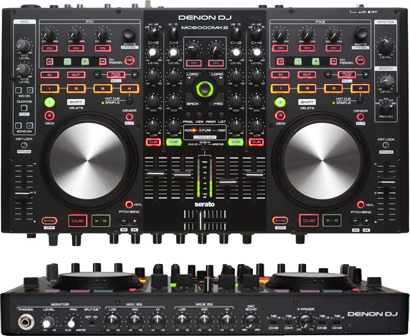 The Denon DJ MC6000MK2 will be available to buy in January 2014.